Several people peer up at the sky to watch the eclipse. Dover resident Fernando Ruiz shows off how he was able to view the eclipse, projecting the image of the sun into a box. While various cities across 14 states saw the moon completely cover the sun Monday, Delaware settled for a partial eclipse. But those watching it still felt like they were part of something extremely rare. Delaware Public Media's Katie Peikes reports on the 2017 eclipse in Delaware. Many state parks, local libraries and museums held viewing parties to bring the community together for the celestial event. Minutes after the moon started to cover the sun at 1:20 p.m., heads donning cardboard and paper glasses tilted towards the sky and “oohs” and “ahhs” were heard around the First State. Weston and her family were experiencing their first eclipse ever at the Delaware AeroSpace Education Foundation (DASEF) at Big Oak Park in Smyrna. 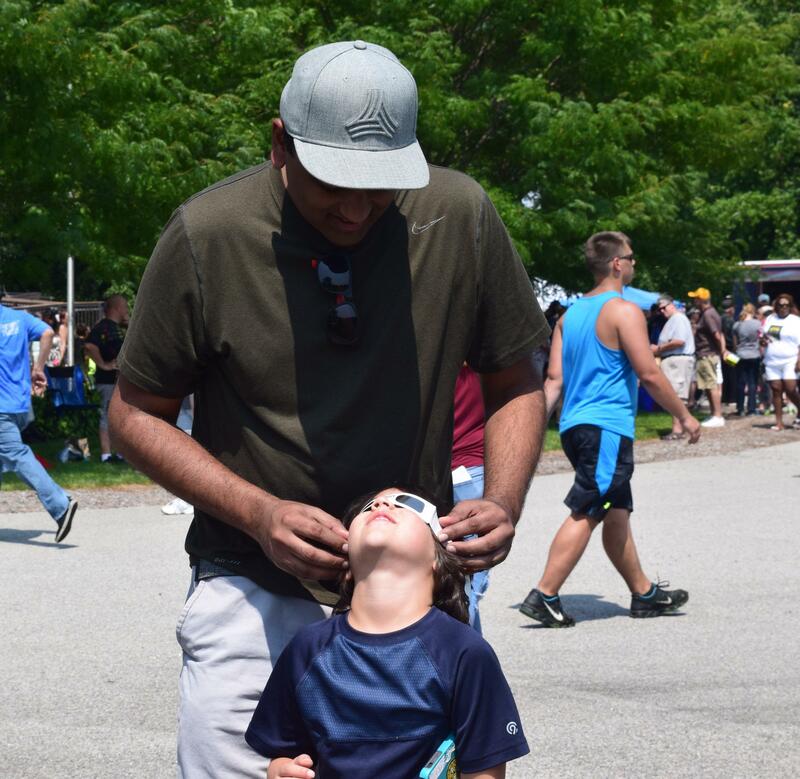 Chaitanya Vardhana from Portland, OR holds a pair of eclipse glasses on his son as he stares up at the sky. The foundation held a party for the event. People could line up to peer through DASEF's huge telescope in the Mountjoy Observatory, learn about the science behind the eclipse, create pinhole cameras and sit on the lawn and enjoy it with their friends. DASEF purchased about 600 pairs of NASA-certified eclipse glasses to distribute to viewers, but DASEF president Stephanie Wright said they did not expect as many as 2,000 people to show up. Wright said they sold out of glasses in the first 15 minutes. They also passed out 100 pieces of cardboard with a hole poked into each one. People couldn’t use them to look directly at the sun, but they could cast the image of the sun onto the ground to see the shape of the eclipse. Knowing that the glasses would be tough to come by, Dover resident Fernando Ruiz came prepared with another way to view the celestial event. Ruiz stuck his head into a giant box with a small hole that projected the image of the sun onto the cardboard. “I was gonna share this with whoever walks up, which I’ve been doing, and it’s all fun,” Ruiz said. At the peak of the eclipse around 2:45 p.m., Delaware saw the moon cover about 80 percent of the sun, darkening the sky a bit and briefly dropping temperatures. "It’s been wonderful to see people interacting, some are sharing their glasses if they were lucky enough to get them, to see people thinking about the universe, thinking about the Earth and its place in the universe and appreciating it and understanding that there’s an incredible phenomenon taking place around us,” Wright said. Wright said with science under fire in the current administration, the eclipse has brought a lot of positive attention towards NASA, space and science. But more than that, she said, it got families to get outside and be active, rather than staying tethered to technology. "People have a lot of handheld devices that they use and sometimes what they need to do is put them down and look at nature, look at what's around them, appreciate the things that are around them," Wright said. When Wright looked up at the sun, she exclaimed "oh my gosh, we're getting better! Have you looked?" But while spectacular, the partial eclipse wasn’t as breathtaking as what many cities across 14 states along the eclipse’s path of totality saw. Day turned to night for just a couple of minutes as a total eclipse swept from Oregon to South Carolina. Dover resident Jan Crumpley saw the total eclipse from a campground west of Knoxville, Tennessee. She said it was the most fantastic thing she had ever seen. “When the moon passed right in front of the sun we had that beautiful corona, we could see stars, crickets started chirping, the street light that was next to us actually came on and we had a sunset all around us,” Crumpley said. They joined campers nearby in cheers of excitement. “It was just the most incredible sight. The corona was so many different colors when we looked right at it, and it was the most fantastic thing I’ve ever seen,” she said. The next total solar eclipse to grace the U.S. is in 2024. It will sweep from Texas to Maine. Delaware won’t get a total eclipse then either, the eclipse will cover portions of Ohio and Pennsylvania. Delawareans will see a partial solar eclipse, when the moon will cover 80 percent of the sun locally. NPR Live Map: Total solar eclipse crosses the U.S. The excitement has been building for weeks and weeks. On Monday, August 21st the solar eclipse will finally be here. It will darken the skies along a path from Oregon to South Carolina. It's the first eclipse that will be seen from coast to coast in 99 years. Delawareans will see a partial solar eclipse, when the moon will cover 80 percent of the sun locally, on Monday. Staying in state to see the partial eclipse or traveling to the path of totality? Delaware Public Media's Katie Peikes reports. On Aug. 21, millions of people throughout the United States will be treated to a total solar eclipse, a rare-occurring event when the moon passes in front of the sun and day turns to night for just a few minutes. But while Delaware isn't on the path of totality, John Gizis, a physics and astronomy professor at the University of Delaware, says there is still something to look forward to in the First State. What will we able to see from Delaware during the Aug. 21 total solar eclipse? Delaware Public Media science reporter Katie Peikes talks with University of Delaware physics and astronomy professor John Gizis.